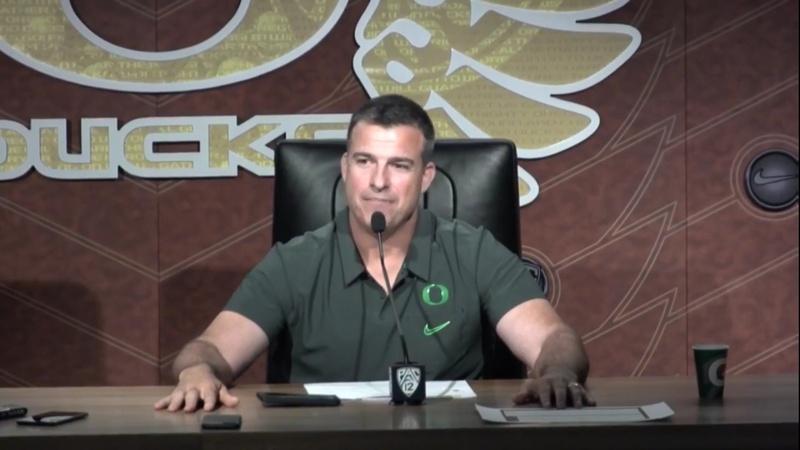 Following Oregon's win over UCLA on Saturday, Mario Cristobal spoke with members of media about the win. One of the big things to come from the conference was the fact Oregon will be without starting inside linebacker Kaulana Apelu for the rest of the regular season. Cristobal also talked about the versatility of his offensive line and re-establishing the run game in the win over UCLA. "Jones did a really nice job. The first couple of plays you could tell he was nervous. Once he settled in he played with power, with poise, with balance. He played hard. It's not only a tribute to him but the guys beside him. Capra did a great job playing as well. Overall some real positive stuff. Brady (Aiello) has been playing good and hard-nosed football." "Lana's going to be out for the remainder of the season. We expect him back for the bowl game." "We started gelling this past week. It helped that we committed more to the run. We move these guys around a bunch in practice. At some point you're going to have to perform that situation. Yesterday in practice we mixed them around even more." "They do have some talented guys on that roster. They have some other guys on the roster that have played quarterback before. Up front by the truckload they have big, powerful guys. That's part of their identity. We're going to prepare as we would normally." "We do. They are the top options. They've worked at it and they've been tapped on the shoulder. It's time to go to work. There's a reason they are inside linebackers, they're instinctive." "Big time guy. He's an NFL guy. He's from my neck of the woods. He has developed tremendously. He's a combination that's the most difficult to defend. He'll runt hrough you, he'll run around you. They were averaging 40+ points for about 4 games straight." "They don't miss tackles. These guys play with great balance. The defensive line does a good job controlling the line of scrimmage. They take the air out of your offensive plays. These guys are complete linebackers. There's a reason they have the productivity that they've had." "As the season goes on, I know he got recognized today. I hope he's further recognized as one of the best players. He wasn't messing around when he said coach you have to look at my high school tape. He showed he can do it. He does a great job." "You want to spread the ball around. What you've seen is his game has elevated. We're a progression passing offense. He's done a great job of getting open. We wouldn't be doing it right if the open guy didn't get the ball. It is a product of him being open. I think Jaylon, Johnny and Schooler have come along."